Bragard Exclusive Design Men's perigord Chef Jacket - White With Gray Piping Cotton - Size 40 by Bragard at Toad Lily Press. Hurry! Limited time offer. Offer valid only while supplies last. Item Contents: Men's Perigord Chef Jacket. Item Specifications: Brand: Bragard. Manufacturer: Bragard. Color: White. Size: Available in sizes 40 US. Available in sizes 40 US. Are you looking for a chef jacket that combines the best in comfort and design? Find it here with Bragard's Perigord Prima Cotton Chef Jacket! 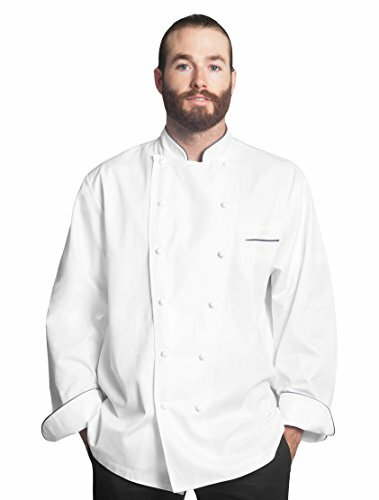 This 100% Prima cotton jacket is designed for the style and comfort of today's busy chef. This jacket has a high officer collar for that sharp look. The jacket is a full cut to allow for maximum freedom of movement. The ample sleeves and underarm air vents promote comfort in a fast paced kitchen. It includes rounded stay-up cuffs and a welt breast pocket for convenience. All of the buttons are hand rolled and crush resistant for durability. This exclusive design is available in sizes 34-54. If you have any questions about this product by Bragard, contact us by completing and submitting the form below. If you are looking for a specif part number, please include it with your message.